Summer is back with a vengeance in Hendricks County, and people aren&apos;t the only ones affected by the heat and humidity -- dogs need some relief, too! Thankfully, Plainfield Parks & Recreation has a solution for your overheated pooch: Its 8th Annual Puppy Pool Party on Sept. 6 and 7 at Splash Island&apos;s outdoor water park. That&apos;s right. Splash Island is going to the dogs during the first weekend in September! I had the opportunity to talk with Nate Thorne, the Deputy Director of Plainfield Parks & Recreation, about this event and he explained to me that the Puppy Pool Party is a fun event for dogs and their owners alike, plus it doubles as a fundraiser for the Hendricks County Humane Society. 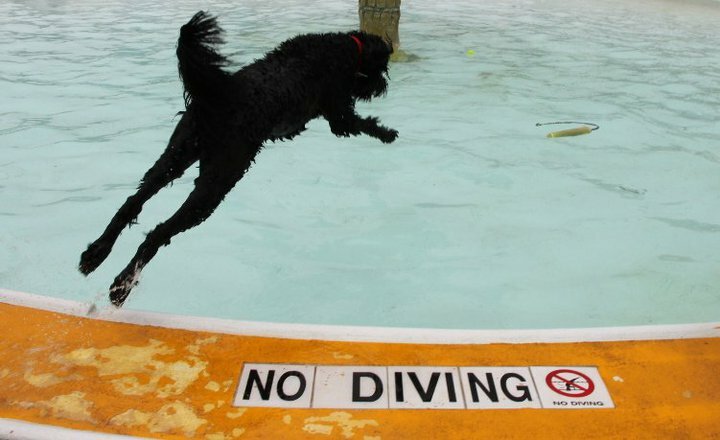 Dog owners: as tempting as it may sound, you&apos;re not allowed to jump in the pool and frolic with the canines while they swim. Instead, you&apos;re encouarged to socialize with other dog owners while your pooches have their fun. And swimmers, have no fear. Nate assures me that the pool is drained for the season after the Puppy Pool Party, so you won&apos;t have to worry about coming home with fleas or anything like that after swimming at Splash Island. Pre-registration for the Puppy Pool Party is recommended, and you can do that by visiting the front desk at Splash Island. Dog owners will need to provide Plainfield Parks & Recreation with proof of current vaccinations. Rabies tags alone are not accepted, so make sure you bring your paper documents from your veterinarian. On Saturday, Sept. 6, small dogs -- those weighing 35 pounds or less -- are welcome in the pool from 11 a.m. to noon and again from 2 to 3 p.m. Large dogs take over the pool from 12:30 to 1:30 p.m. and from 3:30 to 4:30 p.m.
On Sunday, Sept. 7, small dogs can take a dip in the pool from 1 to 2 p.m., and large dogs have the place to themselves from 2:30 to 3:30 p.m.
Nate also brought to my attention another upcoming event that dog lovers will be interested in -- a Halloween-themed event at the Bark Park. I wouldn&apos;t be at all surprised if there is more information about this activity in the coming weeks on this blog. Be sure to visit Hendricks County and bring your pooch to Splash Island on Sept. 6-7 when the outdoor water park goes to the dogs!